Felt is an affordable and easy-to-use craft material that you can create a whole array of things out of! From plush toys, to cushions, accessories, wall art, and decorations – the options are endless! 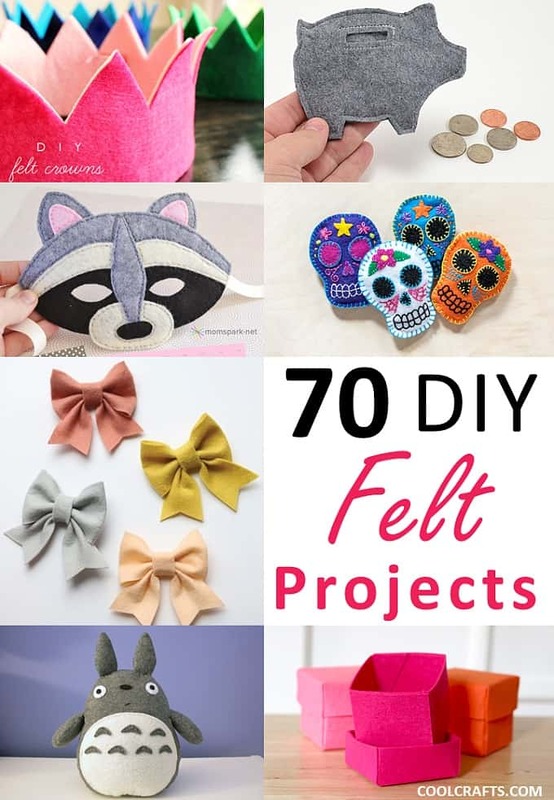 We’ve rounded up a whopping 70 DIY felt projects below for you to try your hand at, with an assortment of tutorials well-suited to crafters of beginner, intermediate, and expert level. These Cinco de Mayo inspired skulls are incredibly easy to make using felt, glue and a needle and thread! Adventures in Making has the full tutorial for re-creating these. These little felt gingerbread man decorations are perfect for jazzing-up your Christmas tree. A Homemade Living has a wonderful step-by-step guide for you. You’ve probably seen this little felt ‘toast man’ by Aiwa-9 all over the internet, but you too can re-create this famous trinket by following this tutorial! Isn’t he adorable? You can even make bookends using felt – genius! A Lion’s Nest has created this quirky and cool rhino bookend which can also be used as a doorstop. 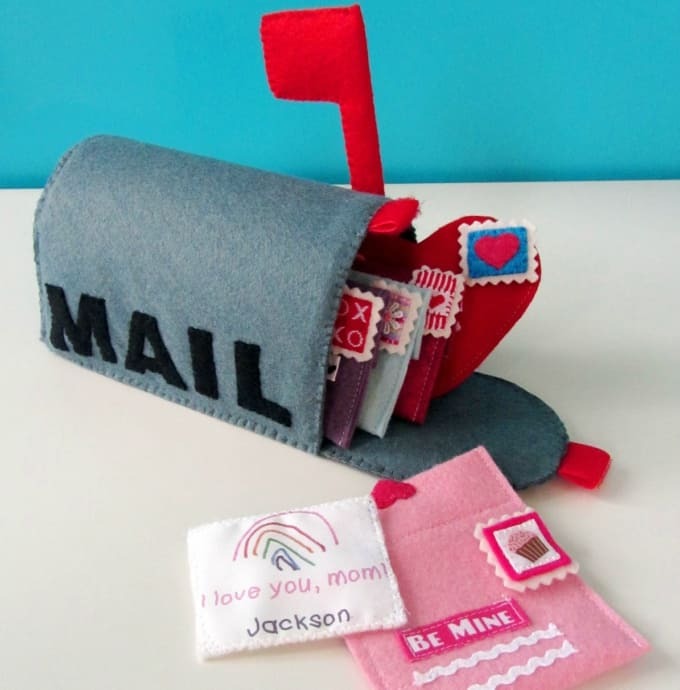 Children are going to love having their own felt letter and letterbox set to play with. American Felt and Craft will show you how it’s done! 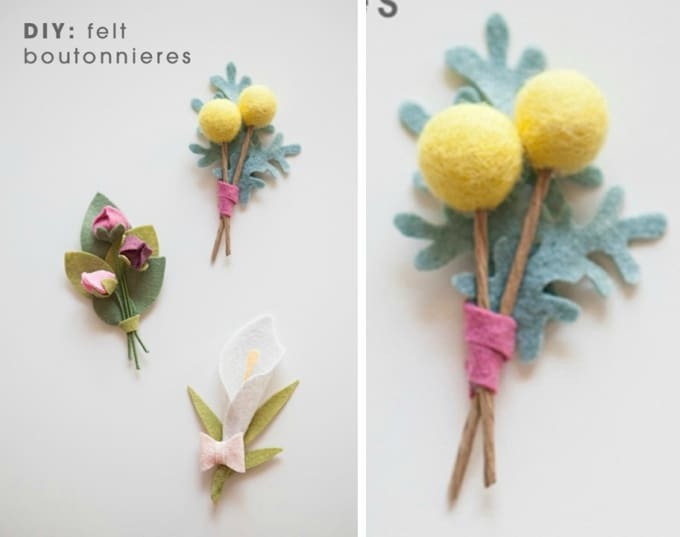 Art Bar Blog has your gift wrapping sorted, thanks to this amazing felt gift garland tutorial. Not only do they look great on presents, but loved ones can also keep the felt garland to display in their home. Awesome! Here’s a wonderful gift idea for a budding artist in your life – this roll-up felt pencil holder by Better Homes and Gardens! It’s a fantastic way to see all of your pencils at a glance too, without the need to rummage around for a certain color. Here’s a super sweet treat which won’t rot your teeth – this wonderful DIY felt lollipop from Brassy Apple! Mix and match the colors for a fun and unique look. Deck the halls with some little felt Christmas pudding decorations, just as Bugs and Fishes has done. This is also a great tutorial for both beginners and more advanced crafters! Guinea pigs aren’t the only ones who will love this DIY felt ornament – humans will too! You’ll also enjoy creating this crafty work of art thanks to this helpful tutorial from Cali Cavy Collective. If you need to whip-up a colorful and eye-catching headband in minutes, then this DIY tutorial from Casa de Lewis is perfect for you! It’s also baby-friendly too. 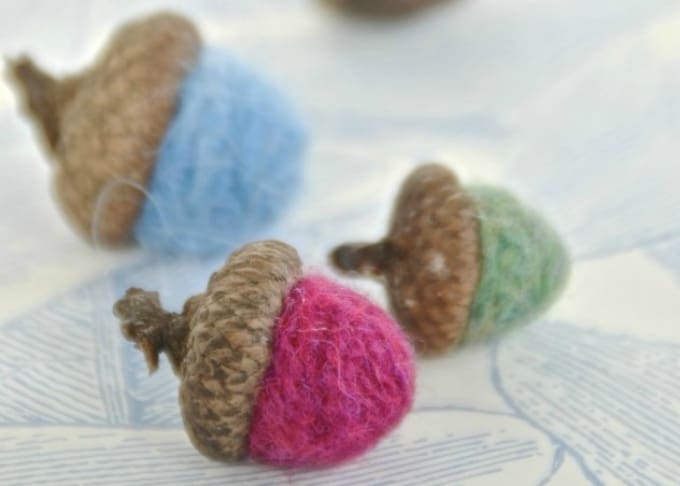 Aren’t these felt acorns lovely? You’d be surprised by how easy they are to create too, so be sure to check out Catch My Party’s instructions! This DIY felt Totoro plushie from Cheek and Stitch will definitely win over hearts! Not only would this project make a great gift for a loved one, but it’d also make a pretty cute addition to your space. The talented Cherie Bobbins has created a toddler friendly felt Christmas tree, complete with decorations! 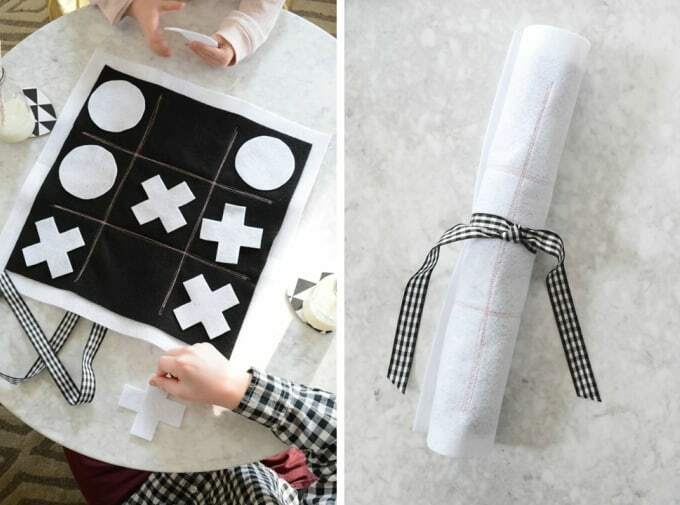 This project is also super easy to make, so be sure to follow her step-by-step guide. If colorful yarn felted acorns are more your thing, then you’re going to adore this tutorial from Classy Clutter. You can even tie some thread to these for eye-catching Christmas decorations with a twist. A girl can never have too many bows, so thankfully Craftiness Is Not Optional has discovered a simple and fun way to make bows using felt! Little ones will love laying underneath this hot air balloon mobile and dreaming the night away. Craftiness Is Not Optional has both the tutorial and template for this design – Wonderful! One of the easiest ways to makeover a simple cushion cover is with some felt, just as Domestic Charm has done. This Christmas wreath design is perfect for the upcoming holiday season. Bring some peace into your home and onto your Christmas tree with this DIY felt dove ornament from Downeast Thunder Farm. This simple tutorial can be followed by children too! Isn’t this felt piggy coin purse from Dream a Little Bigger just perfect? You can even make it in a whole range of colors and they make the perfect stocking stuffer! Not only will this adorable felt bear protect your phone, but its arms can also hold your headphones securely in place – what a genius idea! Easy Fresh Ideas has the tutorial to re-create this cute project. This hydrangea pillow from eHow is stunning and it can be made using budget-friendly felt. You could also recreate this cushion in different colors to create a whole ‘garden’ of them! Here’s another fun, food-related felt project that your kids are going to love. These delicious designs from Everyday Dishes will keep them entertained for hours on end. Do you have a budding handyman or handy-woman at home? They’re sure to adore this felt toolbox project from Fairy Fox – no sharp tools in sight! 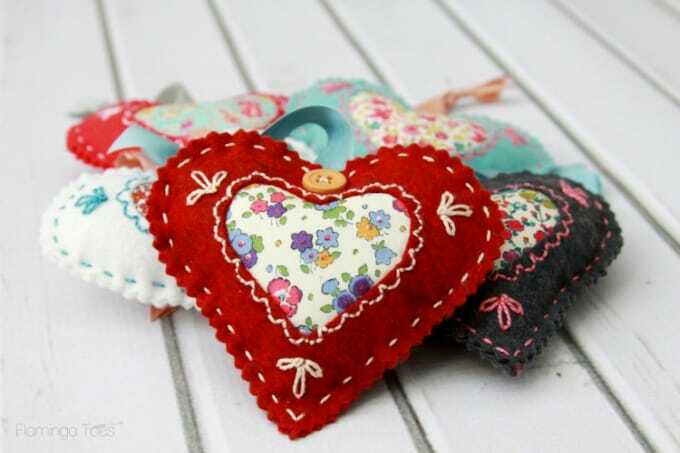 These felt hearts are incredibly beautiful and they would make wonderful gifts for loved ones too. Flamingo Toes has this great step-by-step guide to help you make your very own! If you’re in need of a chic and stylish way to stop your fingers from getting burnt on your morning coffee, then this felt holder from For The Makers is for you! It looks great with studs too. These felt fairy wands from Heartmade Blog will make the most perfect party favors! They’re also super easy to create so those with less craft experience are going to love this tutorial. How great are these felt crowns from Hello Bee? The two-tone felt is a wonderful idea, and they’re fairly quick to create too! Here’s a felt tutorial for those in need of a whimsical statement necklace! Hello Natural has created a colorful garland necklace and it’s so stylish that you’ll want to make more than one. If you’ve got some felt sitting around at home, you can even turn it into these eye-catching gift boxes to store all sorts of trinkets in! How About Orange has come up with this brilliant tutorial. This popsicle brooch from I ManuFatti will have you smiling from ear to ear – Isn’t it gorgeous? You won’t want to stop at making just one. Cookies, broccoli, eggs…oh my! This felt food playset from Lemonwood Clock is sure to tickle the imagination of any child and add a whole new fun element to playtime. Pine cones can be a little prickly and messy, but these felt versions from Lia Griffith won’t cause you any pain. They’re also fantastic to make a wreath out of or to hang on your Christmas tree! 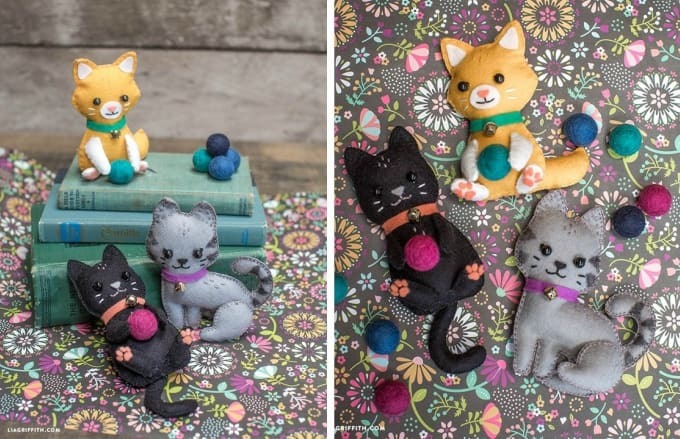 These cats are too adorable – you’ll probably want to make several! Lia Griffith has this wonderful step-by-step guide with images, so they’re not as hard to make as they look!